Look at the PS4 control scheme above in horror, then imagine being an older head returning to the series after years away. Anyone who hasn't played a WWE video game since the glory days of SmackDown vs. 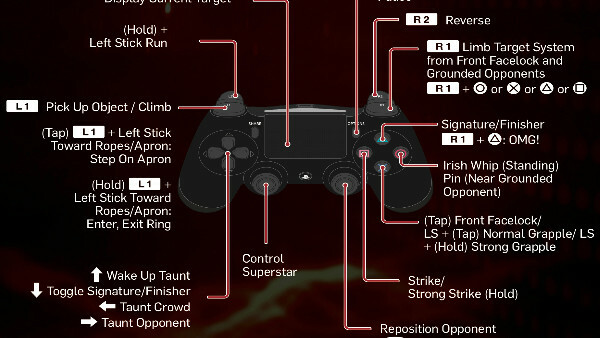 Raw will recoil at the depth of button mapping here. This is in danger of treading into Attitude-like madness. OK, maybe it's not that bad, but 2K's series has become less inviting to rookies than ever, and 2K19 continues that worrying trend. Mastering limb target systems, positional triggering, limited reversals and new elements like the Payback mechanic is slightly overwhelming, and the sheer number of text-heavy tutorial pop-ups 2K give to "ease the load" only worsen it. 2K19 is convoluted at best and downright confusing at worst. Also, despite the agonisingly-slow gameplay from 2K18 being quickened ever so slightly, the gameplay is still a little sticky overall. Other games offer up streamlined one or two-button control methods, and it's time 2K followed suit.